“We traversed a corridor, we ascended a staircase covered with a red carpet and encumbered with works of art, vases, statues, paintings, cabinets containing enamels; then another corridor, and I saw a door standing open. I heard a rattling breath, loud and sinister. I found myself in Balzac’s bedroom. “A bed stood in the middle of the chamber. It was a bed of acacia wood, at the head and foot of which were cross-pieces and straps, apparently forming part of an apparatus for lifting and moving the sick man. 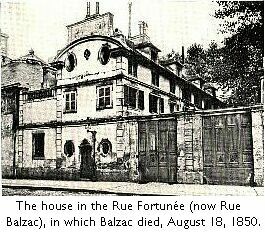 M. de Balzac lay in this bed, with his head supported on a pile of pillows, to which had been added some red damask cushions taken from the sofa in the same room. His face was purple, almost black, and was turned towards the right. He was unshaven, but his gray hair was cut short. His eyes were wide open and staring. I saw him in profile, and, seen thus, he resembled the emperor. “An old woman, the nurse, and a man-servant were standing, one on each side of the bed. A candle was burning behind the headboard on a table, and another on a commode near the door. On still another table a silver vase had been placed. The man and woman stood silent, listening in a sort of terror to the noisy rattle of the dying man’s breath. “The candle at the head of the bed vividly lighted a portrait of a young man, high coloured and smiling, which hung above the mantle. “An insupportable odour emanated from the bed. I lifted up the coverlid and took Balzac’s hand. It was bathed in sweat. I pressed it, but he did not return the pressure. “I descended the stairs, carrying away that livid face in my thoughts; as I crossed the parlour I once again came upon the motionless bust (of Balzac, by David of Angers), impassible, proud and vaguely radiant, and I drew a comparison between death and immortality. 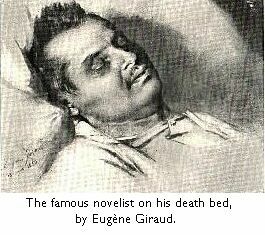 Victor Hugo also delivered an eulogy at the funeral. If you’re interested, you can read it here.